My husband has been suffering with a sore throat the past few days and it’s been very difficult for him to eat any foods. I recently read information regarding oil pulling and had him give it a try to see if it would alleviate some of the pain in his throat. After dinner tonight, my husband oil pulled with the coconut oil for 20 minutes. A few hours later he snacked on a bowl of cheerios and felt no pain. He was quite comfortable while eating. 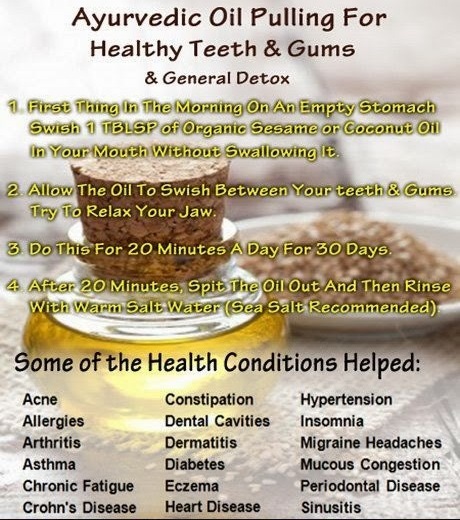 Oil pulling is an ancient Ayurvedic method that is used for detox and rejuvenation. It’s a simple practice, with amazing results. Traditionally, oil pullers used virgin sesame oil. I prefer high quality coconut oil. Coconut oil is my favorite of all oils because of all of its amazing health benefits. See previous post on the benefits of coconut oil. The reason I prefer to use raw coconut oil is because it has antimicrobial, anti-inflammatory, and enzymatic properties. This provides the added benefit of killing any unwanted bacteria that may be residing in the mouth, while leaving behind healthy probiotic strains. To oil pull, simply swish your choice of unrefined, high quality coconut oil in your mouth; similar to the way you would use a mouthwash. The process attracts and removes bacteria, toxins, and parasites that live in your mouth or lymph system, and also pulls congestion and mucus from your throat and loosens up your sinuses. With the help of your saliva, all these bacteria, toxins, and parasites bind with the oil, ready to be disposed of. Pulling also helps re-mineralize your teeth and strengthen your gums by thoroughly cleansing the area. 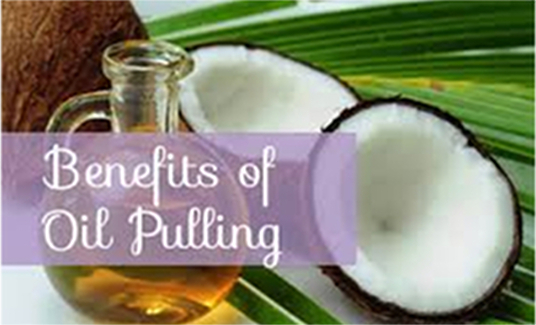 A popular reason for oil pulling is to find relief from congestion in the sinuses and throat. Swishing with coconut oil has also proven to be beneficial to those with skin disorders such as psoriasis, and is great for anyone who wants to detox and begin taking better care of their immune system. To oil pull, scoop 1 full tablespoon of coconut oil into the mouth. Coconut oil is solid, but you do not need to melt it before oil pulling. The heat in your mouth will melt after about a minute or two in your mouth. Now push, swirl, and pull the oil between your teeth, around your gums, and allow it to touch every part of your mouth except your throat. Do this for 20 minutes. You don’t want the oil getting in contact with your throat because it’s now carrying somewhat toxic material. Do not gargle. Once your time pulling is over, spit into the trash or toilet, but never the sink — the oil could solidify and clog your drain. Now rinse your mouth out with clean water two or three times. Finally, drink a glass of water and relax. This entry was posted in Natural Remedies. Bookmark the permalink.